I used to thank my lucky stars that I have the support of my in-laws to help babysit my child. Jayden gets to attend a 3-hour school on weekdays and have his proper lunch & nap in the comforts of a familiar environment. At the same time, it also minimize the exposure of unnecessary diseases such as HFMD. I thought I could put my heart at ease at least until the boy goes to elementary school. But alas, my luck ran out earlier than I could have expected. And so the MIL have to fly over pronto for 5 weeks which leaves the Singapore home here in a mess - Dylan was in reservist, I was due to fly to Perth for business trip for a week and there was nobody to take care of Jayden!! Of course, when the well-being of my son is at stake, I will turn into an enraged mother rather than a sympathetic one. We all have our selfish sides so surely, my son comes first. Then again, all these displeasure and discontent could have easily been resolved if PLANNING was made in ADVANCE. I really don't appreciate last minute bombs! Unfortunately, the damage was done. The FIL took over the baby-sitting for Jayden, the MIL's sister came over to cook the son's lunch and the rest of the adults in the house settled for ta-pao food. I had to accept the arrangement - as long as my son still eats home cooked food, I am happy. With all the inconveniences going on, I decided that this was the last straw. I have been putting the idea of sending Jayden to childcare at the back of my head. I did consider sending the boy when he turns 4 and that we have settled our new home next year, in addition to him having better immunity by then. But life just don't go as what you plan for sometimes. In a span of 2 days, I have scouted and rang 29 childcare centres. (I am not kidding. I even have it on an excel spreadsheet) As expected, all centres were fully booked and on long waiting list. Finding a school for kids these days is a torture! Finally, one of the Oct mummy recommended me Agape Little Uni @ Serangoon. I was apprehensive about selecting childcares as I would prefer someone I know has/is attending the same school. Dropped by the school and fell in love with it instantly. The place was spacious, facilities were CLEAN, the kind of place I can put my heart at ease for my child to sleep in. I have visited one childcare in private housing before and the cleaniness of the building was atrocious. Can you imagine letting your child sleeping on its floor??! Unperturbed, I decided to bring the son to visit the center himself. He must at least like the school to be in it right? We brough Jayden to the center. The boy, as usual, was shy in the beginning. But it didn't took him long to get used to the environment. 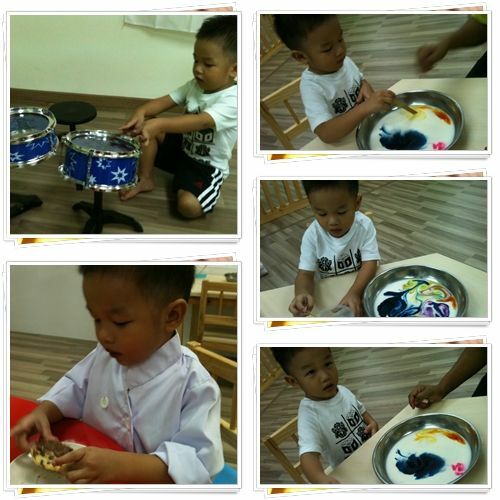 He played the drums on their performing stage, played doh, mixed colors and even spread nutella and sprinkles on a cookie. And then we asked the ultimate question: "Do you like this school, baby?" The boy shouted excitedly: "Mummy! I like this school! I want to study here!" I don't know if it's a moment of over-zealous joy but that was the deciding factor. We signed up on the spot. And for now I can put my heart at ease again. Hi my little girl is turning 19 months soon and im deciding whether to put her in the toddler class at agape little uni! How is the class size and the teachers there? Able to tell me the fees too? Hi there. Didn't noticed your comment until now. Agape at Serangoon is a relatively new school so the class size is pretty small at the moment - which is something I like. Cause lesser children = more attention span from the teachers? The sch fees is $950 before subsidy and they give an extra $100 if you pay by Giro so it works out to be $550. I would recommend that you visit the school yourself and see if your child likes the place.